Will MacLaren is a hardened, plain-speaking bounty hunter. His life centers on finding men guilty of horrendous crimes and making sure justice is done. There is no place in his world for the carefree attitude he carried years before when a tragic event destroyed his dreams. Amanda is the daughter of a successful Colorado rancher. Determined and proud, she works hard to prove she is as capable as any man and worthy to be her father’s heir. 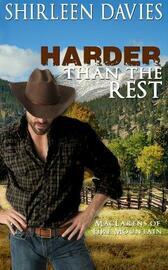 When a stranger arrives, her independent nature collides with the strong pull toward the handsome ranch hand. But is he what he seems and could his secrets endanger her as well as her family? The last thing Will needs is to feel passion for another woman. But Amanda elicits feelings he thought were long buried. Can Will’s desire for her change him? Or will the vengeance he seeks against the one man he wants to destroy—a dangerous opponent without a conscious—continue to control his life? Harder than the Rest is a full length novel with an HEA. Will sat in his room at the boarding house, looking at a poster of the man he would go after next. Groups were his preference—two, three, four—didn’t matter, he just preferred going after more men than spending his time on only one. But this one was different. This was the one he needed to get. Maybe then he could put the past behind him, at last. Emily. His heart always twisted when he thought of his wife and their unborn child. How different his life would have been if she were still here. He sank deeper into the bed, rested his arm over his eyes, and thought of that one horrific day that had driven him across three territories, a couple of states, and might eventually lead him to hell. He felt rather than saw her behind him and waited for Amanda to announce her presence, but she said nothing. “You just going to stand back there and stare at my half naked body, Miss Taylor?” Amanda jumped at his sudden words. Will set down the ax, picked up his shirt, and turned to face her. He wasn’t prepared for the image before him. She wore a simple wrapper over her nightgown, and the full moon cast shadows through both layers of the thin fabric. Her black hair was fashioned in one long braid that had fallen over a shoulder, covering one breast. His mouth went dry and he worked to control his breathing. She was an extraordinary vision. “I…well...” She couldn’t force the words out—they’d become locked in her throat. “Yes?” Will chuckled at her obvious discomfort. “Couldn’t sleep. I often can’t, and need to do something physical to calm my mind. Any problem with that?” He continued to let his eyes roam over her beautiful form as the wind whipped the fabric around her legs and the folds clung to her body. She’d become a stunning sculpture. He tried to drag his eyes away, but found he could not.